Each year I facilitate a Spiritual retreat in Crestone, Colorado, at the base of the Sangre de Cristo Mountains. I’ve been doing it for 16 years. Crestone is a secret Spiritual Mecca, and an esoteric experience like no other. I could tell many amazing stories about Spirit in Crestone but one of my favorite things about this retreat has to do with the daily encounter of humming birds. 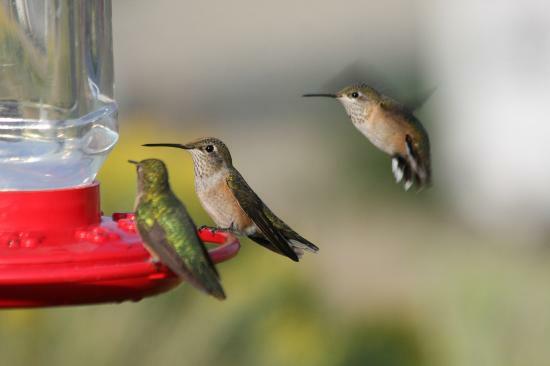 It is no mistake that hummingbirds make such a great impression upon the participants of the Crestone, “Your Next Step” retreat… as hummingbirds are the totem for “joy” (among other things). Just thinking about this opens my heart chakra and causes me to impulsively smile. Those who have been to this particular retreat will smile in reading this, I’m sure. Each morning, as the sun comes up over the basin before us, I offer an optional meditation out on the deck. Nearly everyone takes me up on it. Sitting on the deck at the Silver Star Bed and Breakfast at sunrise is like feeling the Universe Awaken around you. Early morning is cool. That particular year, it was cold and required being wrapped in a blanket. We welcomed the blankets like a mother’s womb wrapping us in Love. We began our meditation as the sun gently moved from the shadow of the mountain to illuminate the entire San Luis Basin, an enormous forty mile valley from the Sangre de Christo mountains to the Rocky Mountains. A crinkle of leaves lets us know a family of deer had ventured forth to greet us. Calm and unafraid, they watch us just a few feet away and continue their morning breakfast of flowers and grass, as we sit in meditation. The wind gently rustles the aspen leaves which must be a signal to the birds to begin their songs in the background. Sweet Sue, the owner of the Silver Star has placed birdseed along the railing of the deck and the birds come to join our morning meditation. The trust of the birds to voluntarily hover within a few feet of us never ceases to amaze me and then I remember, I am here… in Crestone, a place where blood has never been shed. The birds sing, chatter, and eat away at the bird seed. I peek out for a second during my meditation to find a 10 inch tall Colorado Jay, or better known as a Stellar Jay. A shining, iridescent Black Raven makes his moves towards the seed, also. I close my eyes and fall deep into meditation, once again. Suddenly there is a buzz near my forehead. Then above my head. Then at my ears. It’s as if the hummingbirds are stealing kisses. Once again, I peek out. The deck air is filled with hummingbirds. I count 15, 16, 17, 18, 19 hummingbirds and I think – – – aren’t hummingbirds territorial? Don’t they typically chase each other away? Not in Crestone, I think to myself and close my eyes once again. The hummingbirds dart around my face. I can feel their wings inches from my ears. I anchor in that feeling of “joy”. Pure joy, and smile. Purely in the moment of hummingbird wings buzzing and checking ME out. Though the meditation is meant to be nearly silent, awakening to the sounds of Crestone fill the air so much that you can’t help to be fully present and realize how much we are all elevated to a higher calling, to be in joy. The meditation wraps up to the smell of breakfast cooking and the joy-filled laughter from the kitchen as our chef Ann starts us off with another love-filled day in Crestone. Ah, Crestone. Thanks for sharing your story with us Michael. Maybe we will see you in Crestone sometime? I just had an experience I wanted to share. I was sitting on my patio facing the forest and we are visited by hummingbirds all the time. I just had one come to the side of my head and then slowly flew in front of my face, about 3 inches away. I started into his eyes for about 20 seconds and then he abruptly leaned forward and did indeed kiss me on the forehead then immediately fluttered away. It didn’t feel like a beak, it was very light like a kiss. Fortunately my girlfriend saw it from the back screen door or I would have been the only witness. I queried it and found this site so I thought I would add. It was an incredible experience.